On Your MoBO 24/7 Sound Fusion Radio. At Upstairs At The Ritzy, above Brixton’s Ritzy Cinema. 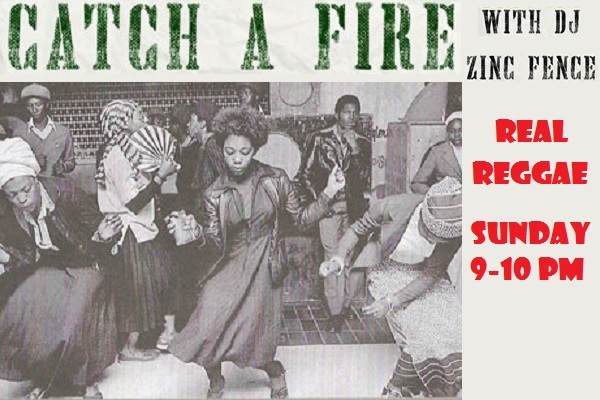 Catch A Fire takes place on the first Sunday every month, presenting a live reggae band and featuring the best in Jamaican vinyl from ska to dancehall on the decks. Free admission, 8-12 pm. On Sunday September 7th we present El Fata & The Victorious Band, just back from an extensive European tour. With 3 other DJs, playing as the Johnny Melody Collective, I also play a second regular night at The Golden Anchor, a great Jamaican pub with great Jamaican food, at Evelina Road, Nunhead SE15 2DX on the last Saturday of each month, featuring ska, rocksteady and early reggae. Over the last year, I have played at the London International Ska Festival, London’s Jazz Cafe, Folkestone’s Ska-Aid Festival, and numerous other events.